Well, where do I start with this weeks NXT? I could talk about the appearances of Dolph Ziggler and Diva's Champion AJ Lee, I could talk about the re-debut of CJ Parker, but no there's only one thing that I can start this blog with...Sami Zayn vs. Antonio Cesaro, Two out of Three Falls. So after months of build up between Sami Zayn and Antonio Cesaro, here we were the rubber match. Now this rivalry has been so incredibly well booked since late May this year, with the two featuring in various match ups also involving NXT Champion Bo Dallas and Leo Kruger, where their rivalry was always made clear during the bouts. Not many WWE rivalries last three months before having their big blow off, but this one certainly did. With the wrestling being so good in their original two contests, expectations were high here and Zayn and Cesaro really had to perform. My intrigue to this one was increased even more when it was made a Two out of Three Falls bout, because of some of the fantastic bouts of this style that we've seen in the past, which usually favour the more technical, scientific wrestler like Zayn and Cesaro. The stipulation present and interesting structure on which to build the story of the match, with the placing of the falls being vital in building the flow correctly. I didn't for a second doubt that this would be a superb match, and seconds in and we were already into the action with Zayn hitting a front flip plancha onto Cesaro as he headed to the ring, after this Zayn quickly got a pinfall via a school boy roll to go one up on Cesaro. It was an interesting way to start the match and really set a different dynamic going forward. We are used to seeing a quick fall in two out of three falls bouts, but usually it's the second fall to quickly even the score. The bout continued with Cesaro quickly gaining control, and despite Zayn attempting to fight back, he would often get caught in one Cesaro's impressive power moves, including a powerbomb after Cesaro had blocked a kick from Zayn. The theme of the second fall would see Cesaro repeatedly attempt to lock in a Chinlock, with Zayn escaping on occasion for a roll up varation for a near fall. With Cesaro eventually hooking the Chinlock in deep, swinging Zayn around, with Zayn unable to break the hold and on the verge of passing out, he just about managed to tap out, giving Cesaro the second fall and evening the match at one fall a piece. Another interesting move in the bout, which would not usually see a submission until the third fall, if at all. Having Zayn tap out to what is usually seen as a rest hold, only worked here because Cesaro locked it in so convincingly and Zayn sold it so well, don't expect to start seeing this in Great Khali matches anytime soon. So we headed into the final and ultimately strongest fall, with even more power moves from Antonio Cesaro and even more heart shown by Sami Zayn. Cesaro used the spot we've seen him use before when he superplex's an opponent from the apron into the ring, before an attempt to suplex Zayn out of small package attempt was thwarted by Zayn who slipped out of the suplex in a school boy roll up for another near fall. The great thing about this match was that it remembered what had happened before and built upon it, it was essentially variations on a theme in wrestling. Throw in some great set pieces like Zayn flying threw the turnbuckles to hit a tornado DDT onto the floor and you had the perfect recipe for an outstanding wrestling match. The ending once again remembered what had happened else where in the match, with Zayn looking for another tornado DDT, this time using the ropes to springboard into the move, only for Cesaro to show an outstanding feat of strength halting Zayn mid DDT, throwing him onto his shoulder, then up into the air for an awesome European Uppercut, before lifting Zayn up into the Neutralizer to pick up the pinfall victory and his second fall to win the match. After the match had built so well, the ending had to deliver and it did in so many ways, the impressive nature allowed Zayn to come out of the battle still looking strong, whilst keeping Cesaro looking like an absolute beast. Now, the way Cesaro has been booked on NXT, makes his current situation on the main roster even more upsetting. This week alone we've seen Cesaro lose on Raw in tag team action against The Prime Time Players, before managing Jack Swagger to a loss against The Great Khali on Main Event, and he certainly deserves a lot more. We've seen failed gimmick after failed gimmick head Cesaro's way, from American flag waving Anti-American to Swiss Yodeller to boyfriend of Aksana and Teddy Long love rival, and at the start of The Real American gimmick with Zeb Colter I felt that the tide could be turning for Cesaro, however he now seems to be being punished for Jack Swagger's extra curricular activity and stuck going nowhere once again. He's taken to all his gimmick as well as he could, but they were just never going to get over, if you see a man yodelling you don't do say “I hope this man get's his arse handed to him” you say “I'll probably watch something else for a bit”. This match with Zayn, along with his match against Daniel Bryan a few weeks back on Raw, could be put up against anything WWE has done in the last year and still look great, hopefully WWE realise the talent they have sooner or later. As for Zayn, he was only helped by this series with Cesaro in the eyes of WWE fans, and title bout with Bo Dallas would seem the logical move for the former Generic Luchador. 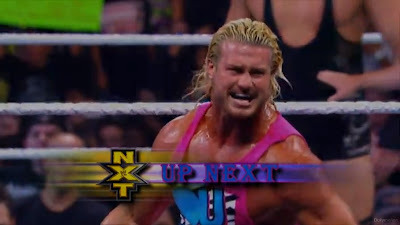 Now I can't imagine that when Dolph Ziggler was advertised as appearing on NXT this week, that the first person everyone thought of as an opponent for the former two time World Heavyweight Champion, was Alexander Rusev. We haven't really seen a lot of Rusev since Florida Championship Wrestling morphed into NXT, and he didn't make his television debut until a battle royal at the end of May. Rusev character feels like a bit of a throwback to me, in his unique attire, he does stand out, aided by his size which intrigued me from the outset, how would Ziggler mold with Rusev's style and what kind of story would they have to tell. I was actually very impressed with Rusev, he works the big foreign heel role very well, with some creative offense, including holding onto the ropes to allow him to deliver some vicious knee strikes to Ziggler's midrift. Continually speak what I imagine is Bulgarian constantly throughout the match, gave him an exotic feel really drawing me into the character, with Ziggler being a great opponent because his selling is so good. Ziggler's speed and precision offense, including a beautiful dropkick, afforded him a way back into the match, eventually allowing him to pick up the victory after Rusev had missed a splash from the top rope, and Ziggler had hit a Zig Zag. It will be interesting to see how Rusev does against someone with less experience and talent as Dolph Ziggler, and if he still looks as impressive as he did here. The Diva's Championship was also on the line this week in a short but fun bout between Champion AJ Lee and challenger Bayley. Bayley's unique character was a good fit opposite Lee and it was clear that the two had a lot of fun putting on this bout, and that transferred to the viewer. Whilst Bayley has her character nailed on, she still needs work on her in ring work, with a pinfall attempt whilst Lee was under the ropes standing out for me. Following a diving Corkscrew Elbow from Bayley, Lee feigned injury suckering the naïve Bayley in, before hitting a Spin Kick to the gut, and finishing the challenger of with a Shining Wizard for the pinfall victory. The bout was what I expected it to be, telling a good story with the characters meshing together well, although there wasn't a whole lot of wrestling on display, it was still entertaining to see. CJ Parker continued to appear backstage, photo bombing Tyler Breeze as he got a fan to take a photo of him, it wasn't particularly funny but set up the idea well enough. 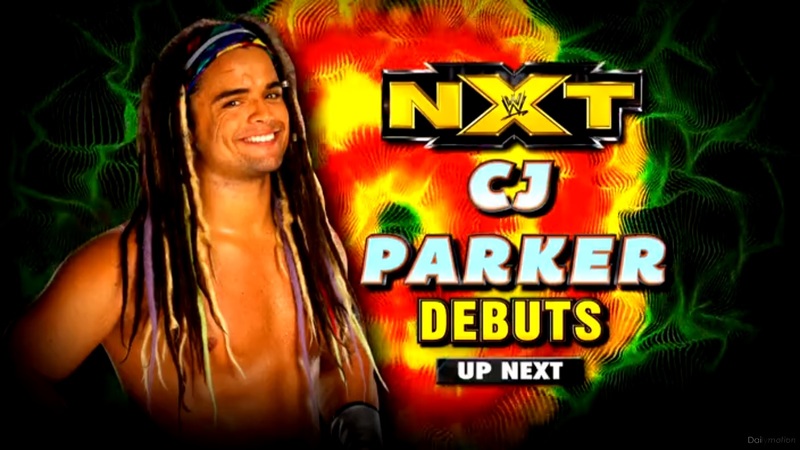 Parker went onto have his re-debut in NXT later on, against Baron Corbin. Parker has been given a new hippy style gimmick, which is reminscent of Spanky's run as The Brian Kendrick in WWE between 2008 and 2009 in characterisation. The bout ended quickly with Parker picking up the victory with a unique variation of a DDT. The bout was quick and was only really there to serve as a way of showcasing Parker's new gimmick, which looks promising. After the bout, Breeze interupted an interview between Parker and Renee Young, to confront him about the photobomb. It was a bit goofy, but worked for these characters, with Parker eventually going to punch Breeze only for Breeze to quickly escape. I expect more from these two in the coming weeks on NXT. The Ascension continue to plough through numerous enhancement talent on NXT and this week Conor O'Brian and Rick Victor were in action against Ron Hicks and Michael Zaki. This bout was pretty similar to the contest The Ascension had on 24th July, as they destroyed Hicks and Zaki with a number of tag team moves used in that bout, including finishing off Hicks with their version of a High Low to allow Victor to get the pinfall victory. It would seem that The Ascension will be getting an NXT Tag Team title shot against Corey Graves & Adrian Neville soon, mainly because they are the only real heel tag team that we've seen on NXT, since The Wyatt Family have left. What did I learn from this weeks NXT? 1. Cesaro and Zayn are two of the best wrestlers in WWE. 2. Alexander Rusev has potential in the Bulgarian Big Man role, if he can perform against opponent not as good as Dolph Ziggler.